When it comes to long, gentle winter braising, there are no better aromatic companions than rosemary and thyme, either together, or bringing their own individual characteristics to bear. However, while neither are happy with menial roles in the kitchen, they never seek to dominate the proceedings, preferring to play a strong, supporting role, safe in the knowledge that their presence is appreciated. In short, both herbs believe less is more, and carry out their duties very effectively. Rosemary is a bit of an attention seeker in the kitchen garden, thanks to the dramatic dark green spears that emanate from each branch of the bush. In this case, appearance are not deceptive either – those spears, even when finely chopped during the battuto stage of the cooking process, need at least an hour or so in the casserole to loose their toughness. For this reason, you are never going to find this herb utilised as a garnish. 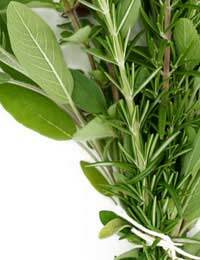 The aromatic, gentle sweetness of rosemary means that the herb lends itself to a wide range of meat dishes. In common with many other parts of Europe, the Italians are quite happy to attach a few branches to an arrosto of either lamb or pork and let the cooking process do the rest, the kitchen filling with that unmistakeable aroma as the roast meat enjoys a couple of hours in the oven. Rabbit and wild boar are two other animals popular with the Italians that combine well with this herb. The same is true of chicken, rosemary sitting happily in the cavity of the bird along with a couple of halve lemons to provide an extra aromatic boost, while a tray of potatoes drizzled in olive oil also emerges from the oven all the better for the companionship of rosemary. The herb is also one of the most popular additions to the top of a focaccia prior to baking. A branch or two of rosemary works well with a range of salt- and freshwater fish such as sea bass, cod and mackerel, either pan fried or steamed al cartoccio (in foil or parchment), depending on the individual recipe. Thyme, on the other hand, is far too delicate to be exposed to the intense heat of the oven, those small, pale green leaves preferring to bathe in the gentle simmer of a braising liquor. Given its subtle, sweet nature, it is best suited to milder meats such as pork and veal, but it is more than capable of holding its own with more dominant flavours competing for attention in the pot. For example, those who prefer their ragu (bolognese meat sauce) less than authentic – the real deal does not incorporate herbs – thyme is a mighty fine substitute for oregano. Unlike rosemary, the delicate texture of the individual leaf means that it can also be added to pan-fried, thinly beaten poultry cuts of chicken and turkey where the relatively brief cooking time serves to preserve its physical and aromatic integrity. This delicacy also translates into more subtle offerings such as bocconcini of buffalo mozzarella, served with a drizzle of oil and some fresh thyme leaves, or some strips of roasted red pepper, again sott’olio (under oil). Unlike the more robust rosemary bush, thyme is best grown on a window box to shelter it from more inclement weather. You may be tempted to invest in a pot of lemon thyme at the same time, but given the stronger taste of this variety, remember to use it sparingly to avoid adding too much of a citrus accent to the finished dish.